Having striking and unusual features, the Corroborees frogs have two species, namely Southern and Northern Corroboree that inhabits mountains and colder regions of Australia. Facing sharp decline, these frogs are a handful now and are found in the Kosciuszko National Park. To revive their population researches are on and many programs undertaken. Why is the Corroboree Frog Endangered? 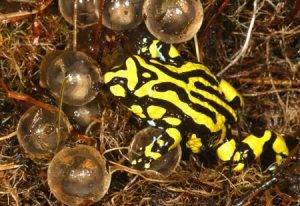 How many corroboree frogs are left? Some characteristic features of this frog have been listed here. It has a very distinct appearance endowed by black and yellow stripes on its skin. 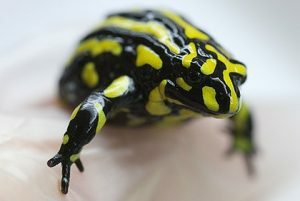 It has combination of black and white or yellow and black on its belly. Northern ones have thinner yellow greenish stripes. Skin texture from the top is rough while that of the underside is smooth. They have un-webbed toes which is very dissimilar to the other frogs. 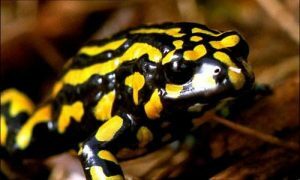 These frogs have a limited distributional range which includes Victoria and New South Wales in Australia as their population is sharp declining. The Southern species of the frogs are distributed only in Kosciuszko National Park’s snowy mountains and the northern Corroborees occur in Brindabella Ranges and State Forests closer to the Fiery Range. They are usually concentrated at areas above 1300 meters altitude. 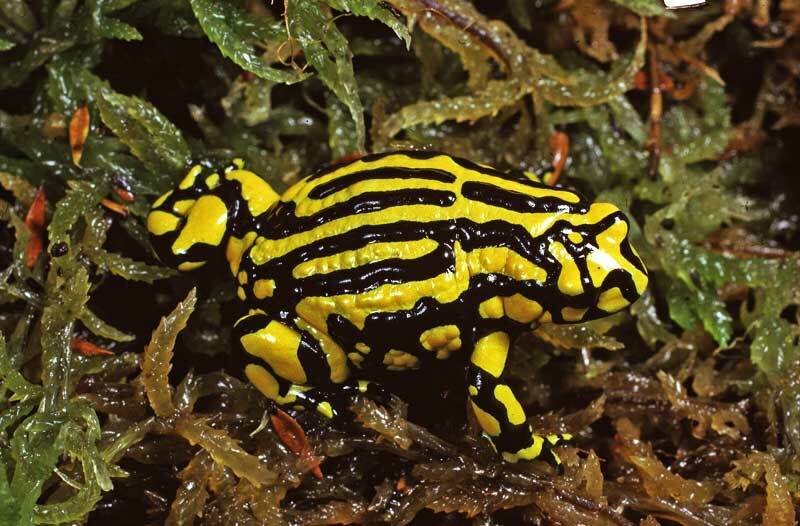 Sub-alpine retreats are preferable habitats of the Northern Corroboree frogs. Water bodies with low water levels and ample surface area are some more habitat specification of the specie. They remain under piles of logs and leaf litters when they are not breeding. Sphagnum bogs and the high altitude snow gum woodlands are the main habitats of the Southern Corroborees, stretched for around 400 square kilometers. Males and females move into wet heaths, pools and bog vegetation with the onset of the breeding season. As soon as it ends, they move into woodlands that can be beyond 300 m.
Males mate with several females during the mating period. Males safeguard the eggs in the burrows where they are laid. They walk do not walk like frogs as they have no webbed feet rather they resemble lizards while walking. As tadpoles they stick to eating organic substances and algae around the pools but as adults they feast on food like larvae of insects, beetles, ants as well as mites among other invertebrates. Feeding pattern changes during the winters when it doesn’t eat or eats very less. For living in the wild, they have adapted themselves to the natural surroundings. They are more suited to living in the mountains than in low lying areas. They have a poisonous skin, which is a result of secretion of alkaloids. These frogs are able to store uric acid like water whenever they are not in water. From this they will be able to extract out water whenever they need it. Tadpoles hatch out of the eggs once their nests are overflowing with water after the rains during autumn. After coming out of their shells they move to the nearby pool where they feed on algae and other substrates. They gradually develop into frogs in the due course of time till summer approaches. It takes as long as 9 to 10 months to transform and longer to attain sexual maturity. Males reach the mating sites near shallow ponds where they make nests of bark and other materials. Both the species follow similar rituals for mating, which starts by calling out to the females to secure their attention. Once they start copulating, after the end of the process the male frog mates with other females. January and February are the breeding months of the Corroborees. These frogs become sexually mature after reaching 4 years of age after which they copulate. Up to 35 eggs can be laid by a single female and the burrow might have many eggs from other females mating with the same male. Males directly eject sperm on the eggs in which the tadpoles start developing till they mature enough to break out. It takes around 7 to 8 months for the tadpoles to develop completely and hatch. When they start developing, requirement of water raises which is supplied by the flood water that engulfs the nests. Life Span of these frogs is around 5 years. They go into hiding during winters when there are no activities from their side. They find refuge under fallen leaves or bark of trees in the region they put up. These striped frogs face dangers due to various factors. They face very minor threat from some birds and fishes but one of the reasons for it being endangered is its life cycle, under which a long time is involved in its maturity. Annually, only small clutches are laid which makes it difficult to increase the numbers. Formation of fungus and destruction by humans cannot be ruled out from its impending danger list. These frogs are critically endangered and the Southern Corroborees exist in just a few hundred in the whole world. In such cases, they cannot be kept as pets. According to the IUCN status these frogs have been enlisted as Critically Endangered species. Their numbers have declined sharply over the years and hence several conservational efforts have been taken to preserve their existence, among which rescue programs are common. As per data collected from various sources it can be stated that the northern variants are at a better position than the Southern ones. They have been destroyed by recurring habitat destruction along with many other natural causes. These critically endangered species should be protected under various programs. Around 150 of the Southern corroborees are said to be left in Kosciusko highlands. Interestingly, around 10 females lay eggs in the burrow dug by the male and if that overflows with eggs, he digs another. Their toes are not webbed like other frogs. They can be hardly spotted mostly due to their secretive nature. It is assumed that they are capable of producing poisonous alkaloids on their own unlike other frogs. They derive their name from an Australian native word Corroboree which means gathering where the natives used to come with painted forms very similar to the way the frog looks. The Southern Corroboree frog is almost close to extinction as it has faced a sharp decline in its population. It is mainly due to a disease caused by a fungus which has caused their decline part from other factors. The males of the Southern species act as guards after the eggs are laid. Studies have revealed that there are various breeding locations of the Southern corroborees. Captive-breeding programs have been started at the Taronga Zoo. Recovery plan for the southern variants have been introduced as a conservation initiative. It can be hoped that such wonderful creation of nature can again be revived and can be again seen in the Alpine regions like they used to do in the past. Here we have provide the pictures of the Corroboree frogs. Hey, does anyone know how these frogs live in the cold weather? I have looked at many sites but can’t seem to find anything.